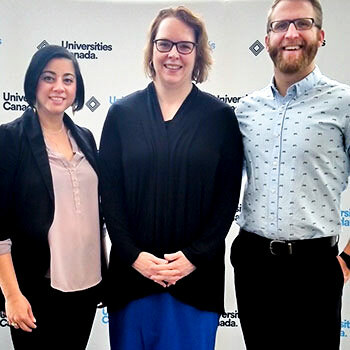 At the beginning of February, I attended the Universities Canada Univation forum in Ottawa with two of Laurier’s Master of Education students: Sharline Doss and Adam Rooke. The conference brought together leaders at universities and in business with students and entrepreneurs to examine how universities can best prepare students for the future. I moderated a panel discussion on Innovations to Improve Student Access and Success. It was clear from the forum that Laurier is showing leadership in student accessibility. We are proactively engaging with traditionally under-represented groups to encourage greater enrolment and success at our university. I truly believe that universities should be a mirror of society. We need to ensure that all people can benefit from the opportunities that a university education provides. As well, strong partnerships inside the university and with the wider community are critical to both student success and research that will have a positive impact on our world. Laurier is already showing leadership in these areas. We have prioritized experiential learning to ensure our students are equipped with skills that will help them excel when they graduate. Laurier has the largest undergraduate business co-op program in Canada. We offer opportunities for experiential learning at the graduate and undergraduate levels in disciplines spanning education, music, science, social sciences and humanities and social work. We have also taken steps to make our campuses more inclusive. Traditionally under-represented students such as those from low-income families, Indigenous communities, racial minorities and people with disabilities face complex barriers to accessing and succeeding at a university education. Laurier is bringing down those barriers through internal supports and community partnerships. A successful example of this is the Access to University Program, where we work with the Kitchener social agency The Working Centre, to providing support and specialized courses to ease the transition to university for non-traditional students.